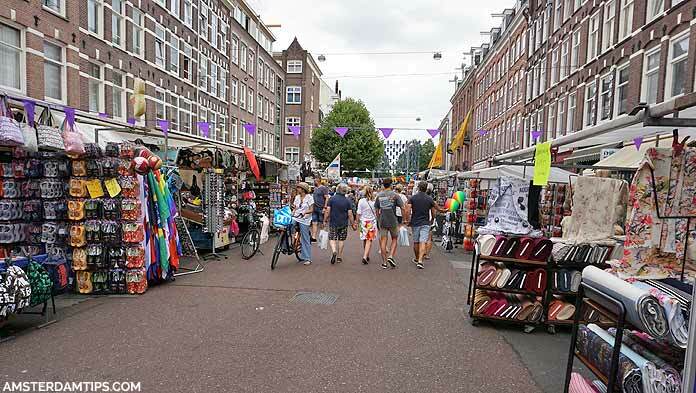 There are a number of street markets around the city of Amsterdam which could be of interest to the visitor. Markets are always a great place to observe and participate in local life. The following article reviews each street market plus we also list some special market events happening in Amsterdam. This is the largest street market in the Netherlands, located a short walk south of Amsterdam centre in the trendy De Pijp neighbourhood. Established back in 1905, it runs along the Albert Cuypstraat and is open Monday to Saturday 0900-1700. There are some 260 market stalls which sell all sorts of food and non-food items. You can find fresh fruit and vegetables, meat, fish, cheese and nuts. Try out a raw herring (haring) from the fish stall. Non-food items include souvenirs, textiles, toiletries, clothes, shoes, bags, bedding, cycle accessories and small electrical items. Some stalls are linked to a shop behind with a wider selection of goods. Prices are reasonable as the market is mainly frequented by local residents. It is well worth visiting the colourful neighbourhood with many other interesting shops, cafés and restaurants – from traditional Dutch to more ethnic varieties. At Eerste Sweelinckstraat you will see a statue to the late Amsterdam folk singer André Hazes. By public transport, Albert Cuyp market can be reached by trams 16 and 24 (stop Albert Cuypstraat), tram 3 (stop 2e Van der Helststraat) or tram 4 (stop Stadhouderskade). Calling itself Amsterdam’s “world market”, it is located on Dapperstraat in the working class Amsterdam Oost (east Amsterdam) district. This general market has around 250 stalls and runs Monday to Saturday 0900-1700. It has a lively atmosphere with many multicultural sellers including those from the well established Turkish, Moroccan and Suriname communities. Prices for goods are on the cheap side – so head here if you’re on a budget. Get here by trams 3 or 7 (stop Dapperstraat), tram 9 (stop 1e Van Swindenstraat) or tram 14 (stop Pontanusstraat). Amsterdam Muiderpoort train station is also a short walk away. This large flea market runs Monday to Saturday 0930-1800 and you can find a whole host of curious items – from designer bags and T-shirts, second-hand clothes and books, music, arts and crafts, to the more eclectic stuff like military helmets, badges and uniforms…and quite a lot of old junk. Also good for second hand bikes and cycle accessories. Located just east of the centre in what used to be the Jewish quarter. The square in the centre of Amsterdam hosts a small number of market stalls during weekdays 0900-1800 selling food and flowers. During the summer months there is a flea market held each Sunday. This general street market has over 100 stalls selling food and non-food items. It is located just west of the city centre at Ten Katestraat just off the main shopping street Kinkerstraat. You will find plenty of Dutch and ethnic fare on offer. Open Monday to Saturday 0900-1800. This is a popular general market with over 230 stalls every Saturday 0900-1700 running along the Lindengracht street in Amsterdam’s Jordaan district. A decent range of items are found on sale including fresh food, clothes, leatherware, household products and cycles. The Jordaan area also hosts a 150 stall general market along Westerstraat every Monday 0900-1300. It sells food and non-food items though it is known as the Lapjesmarkt, specialising in fabric and textiles including new and vintage clothing. There are organic farmer’s market (boerenmarkt) held weekly in Amsterdam. Noordermarkt (Saturday 0900-1600) – held in the picturesque square of the Norderkerk church in Amsterdam’s Jordaan district, just round the corner from the Lindengracht market. 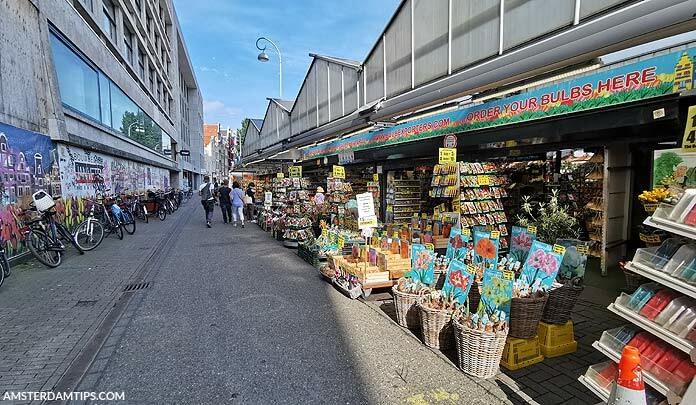 With a friendly atmosphere, the Noordermarkt hosts organic (bio) food producers/specialists selling a wide variety of tasty and sustainable products – fruit and vegetables, meats, cheese, fish, bread and more. There is also a small flea market running alongside which offers all manner of bric-a-brac – from designer furniture, clothes, jewellery to old books and records. The flea market is also open Monday 0900-1300. Haarlemmerplein (Wednesday 0900-1700) – midweek market held at the square at the end of Harlemmestraat with high quality food products on offer. For more info see our organic shopping in Amsterdam guide. Zuidermrkt is a weekly market on Saturdays (0930-1700) in the small square on Jacob Obrechtstraat and Johannes Verhulststraat close to the Concertgebouw on Museumplein. You can find a good variety of products, much of which is sustainable and/or organic. Pure Markt is held on a particular Sunday (1100-1800) each month at both Park Frankandael and Amstel Park – in the south-east of the city. The Netherlands is a world leader when it comes to flowers. The floating Bloemenmarkt (open Monday to Saturday 0900-1730, Sunday 1130-1730) is located right in the heart of Amsterdam on the south bank of the Singel canal between Muntplein and Koningsplein. Whilst a little bit touristy and often crowded, you can find flowers, plants, bulbs, seeds and other souvenirs here. If you want cheaper flowers then consider buying at Albert Cuyp market. This square in the heart of Amsterdam hosts a couple of weekly markets. The Spui book market (Boekenmarkt) specialises in a variety of second-hand books and is attended by around 25 book dealers from around the country. You will find a mix of old, rare and out-of-print books – mainly in Dutch but also some in English, French and German – as well as prints, posters and documents. Books are traditionally expensive in Netherlands so don’t expect a great bargain. Every Friday 1000-1800. The surrounding Spui area houses quite a number of popular Amsterdam bookshops – including ABC, Athenaeum and Waterstones. 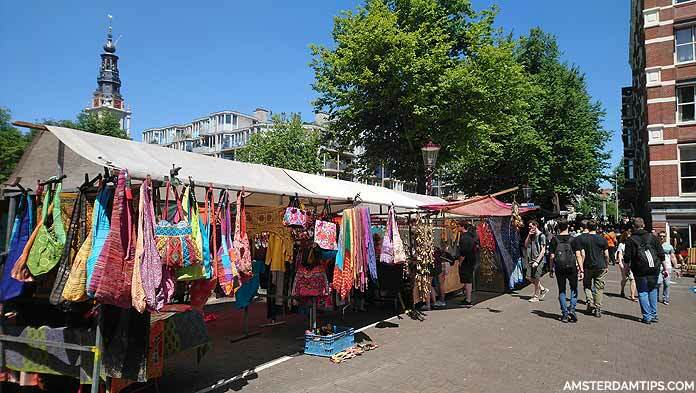 Also at Spui square every Sunday (1000-1830, Mar-Dec) is the ArtPlein Spui art market which has 25 stalls from a pool of around 60 Dutch and international artists. On sale can be found different mediums – paintings, sculptures, ceramics and jewellery – where artists can exhibit their work and connect with buyers directly in an informal atmosphere. This small book market at Oudemanhuispoort is held in a covered passageway that connects two buildings of the University of Amsterdam. Open Monday to Saturday 0900-1700, it sells a variety of second-hand books, prints, photographs and sheet music. The Antiques Centre Amsterdam (previously known as De Looier) is the largest indoor antiques market in the Netherlands. Located at Elandsgracht 109 (a short walk from Leidseplein), it has 55 dealers stands offering a diverse range of antiques for sale. You will find glassware, ceramics, porcelain, gold, silver, paintings, prints, ornamental pieces and more. Open Mon, Wed-Fri 1100-1800, Sat-Sun 1100-1700, closed Tuesdays. There is an onsite café called Brasserie Blazer. 3 days a week (Wed/Sat/Sun) people can rent table space to sell their antiques. On Nieuwezijds Voorburgwal outside the stamp shops there are a few traders and collectors who set up shop on Wednesday and Saturday 1000-1600. These enthusiasts trade in stamps, coins, postcards and phone cards. Considered one of the biggest flea markets in Europe with up to 750 stalls of private sellers. Held over a weekend about once per month at the IJ-hallen at NDSM wharf, standard entrance costs €5, children up to 11 pay €2.